This stadium, next door to The Citadel in Charleston, plays host to America’s favorite past time. 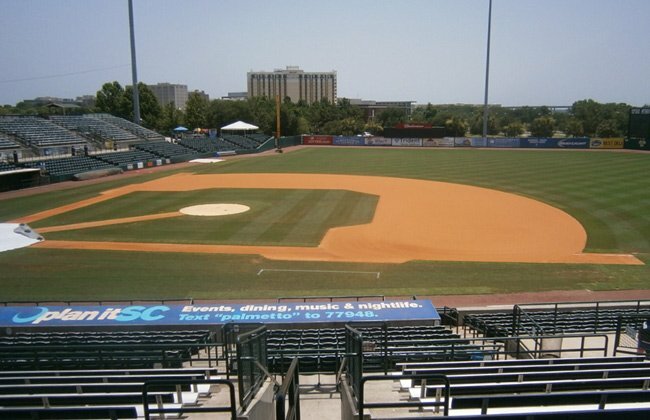 Home to the RiverDogs, a Single-A South Atlantic League baseball team, as well as The Citadel Bulldogs baseball team, the park was built in 1997. 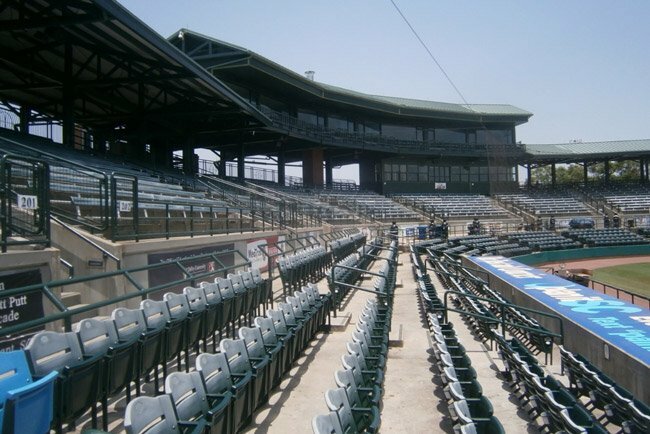 It seats 6,000 fans and is named for Joseph P. Riley, Jr., the city’s longest-serving mayor. Mayor Riley’s first term began in December of 1975; he retired at the end of his term in 2015 and was succeeded by Mayor John Tecklenburg. “The Joe,” as locals affectionately call the ballpark, replaces an earlier nearby ball field known as College Park. College Park opened in 1939 next to Hampton Park and ultimately held up to 4,000 spectators. 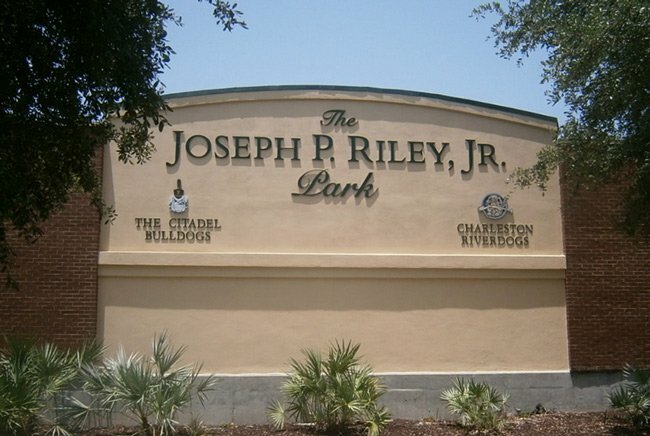 When the City of Charleston was ready for a bigger and more modern ball field, it negotiated a land swap with The Citadel, which owned the land where the Joe Riley Stadium now stands. In exchange for the land, the military college received the title for College Park and lifetime playing rights at the new park, where the school also has a clubhouse. College Park is now used as a practice field for Citadel athletics as well as for community sports. Charleston’s original team was called The Royals, formed in 1980. The team became the Rainbows in 1985, and finally, the RiverDogs in 1994. During The Joe’s opening season, the RiverDogs set an attendance record of 234,840. Attendance has only grown since, thanks to the popularity of low ticket prices and zany theme nights such as Luau Night and Zombie Apocalypse Night. The park is also famous among Charlestonians for its concessions, ranging from beer shakes to gourmet hot dogs. People flock to see Tony the Peanut Man, who has been a fixture of the baseball stadium since it opened and the Charleston Market for more than two decades. His peanuts, people claim, are the stuff of legend. 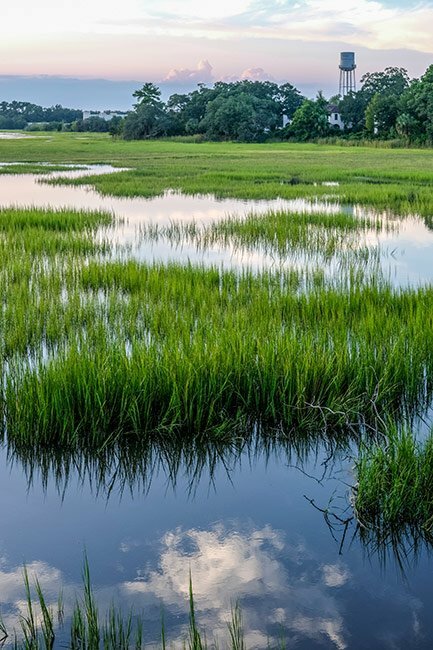 An affiliate of the New York Yankees since 2005, the Charleston RiverDogs attract thousands of guests per game to their stadium overlooking the Ashley River. Spectators never know who they’re going to see at a RiverDogs game, either; Mayor Riley, a huge fan, is often spotted supporting his city’s team, as is actor and comedian Bill Murray, a part-time Charleston resident and co-owner of the team. In fact, the irrepressible Murray is listed as Director of Fun in the RiverDogs staff roster. As fitting as Murray’s official title may be, fans don’t need the Caddyshack star to have an immensely fun time at The Joe. Along with all of the aforementioned fun to be had at The Joe, one of the park’s most alluring features is the view it affords. 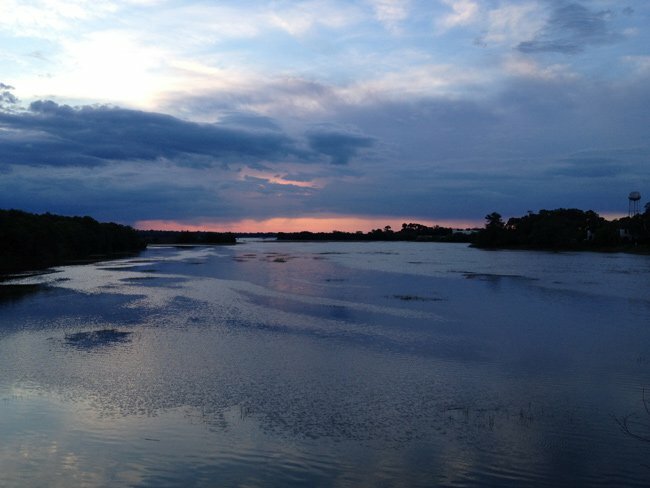 Above is a glimpse of the salt marsh from the stands, reminding spectators that an evening at The Joe is like no other minor league experience.